I have only been to Giraffe once before and that was when I was much younger so this was totally new for me and for Georgia too! We decided to go along to the Spitalfields one and I'm pretty glad we did, my first idea was Stratford because that is just my usual but westfield is crazy and Spitalfields had a much nicer, relaxed and calm atmosphere! As per usual, we started with the cocktail menu and was very pleased to hear that it was happy hour meaning they were around £3.50 each. I had an apple and elderflower cooler which was pretty strong but it was good, anything with elderflower in it and I'm good! 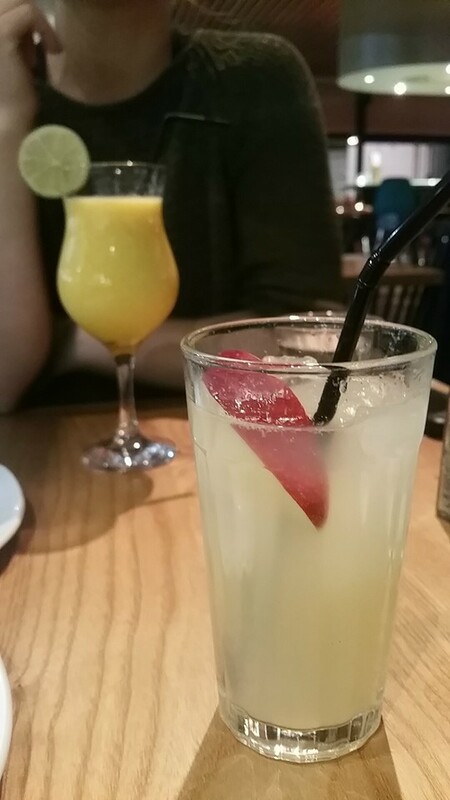 Georgia had a mango and lime daiquiri which looked very tropical in its cocktail glass with a slice of lime. 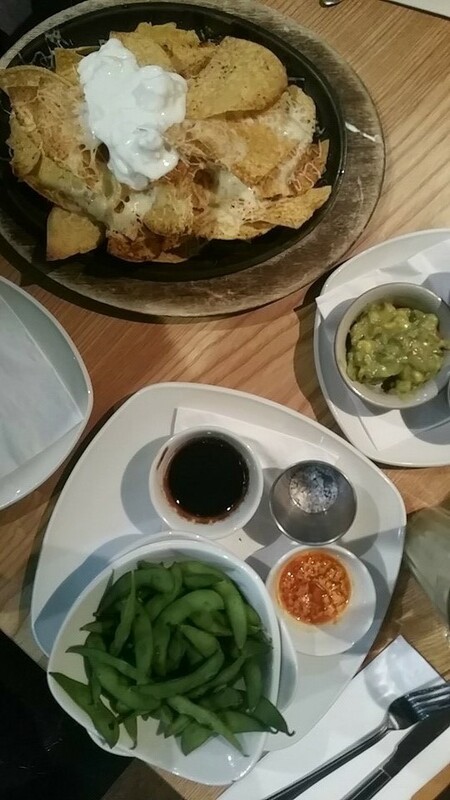 I think she has a thing with sharing starters so just like last time we decided to choose from the sharing menu and started off with a big plate of nachos with all the spicy stuff on the side. I can't be doing with all that spice and Georgia loves it so she took that and left me with the guac (winning if you ask me.) Nachos are great for picking over while you chat and we also had a bowl of edemame which in true georgia/georgina fashion had to have its condiments served separate because Georgias gluten intolerance means no soy sauce. 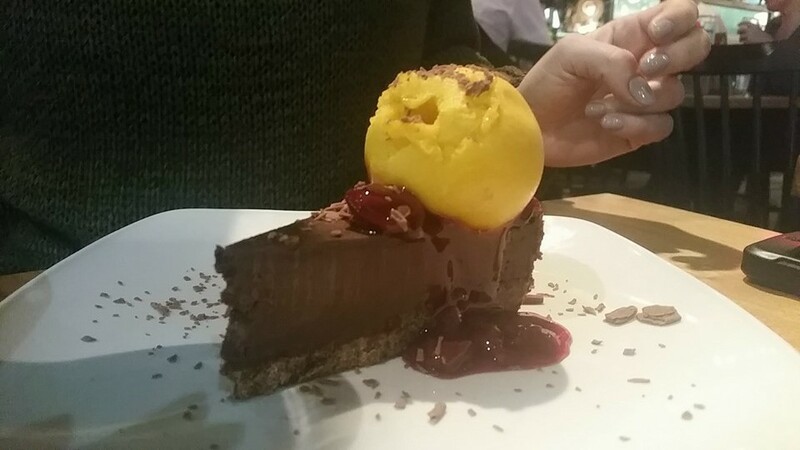 Luckily for us, they actually have a whole seperate gluten free menu which made it very easy! We went for lighter mains than usual as I wasn't feeling too hungry. 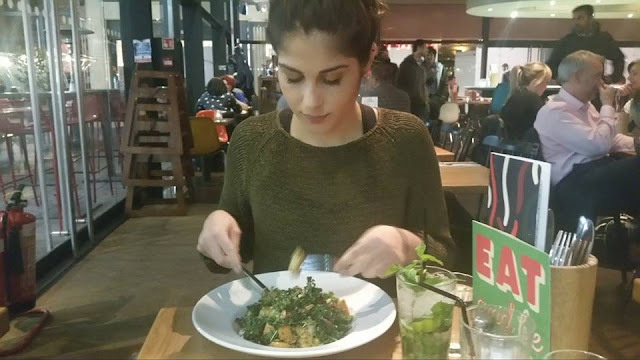 Georgia had a Moroccan salad which looked amazing, green and fresh kale sprinkled with pomegranate seeds and almonds. I went for the Thai duck stir fry which was more noodily than I was expecting. 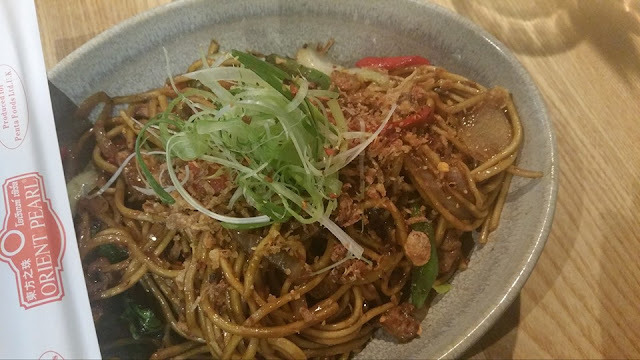 It was more like a noodle dish than a stir fry - I was hoping for a lot more veg as there was hardly any - but I liked the duck and the noodles were nice, I just wish there was a bit more veg. 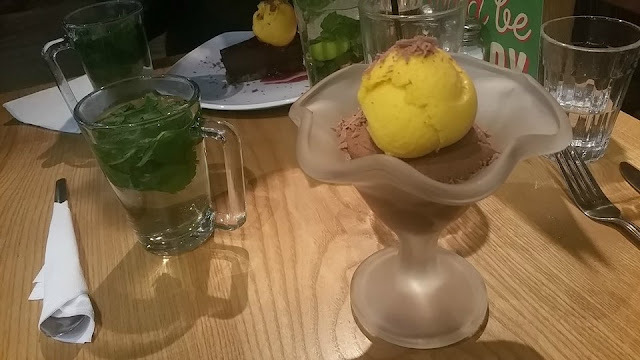 After that we were both completely stuffed but there was no way either of us was going to turn down dessert especially when we found out they had mango sorbet! We both ordered our dessets with sorbet instead of cream which was a great idea - both the chocolate mousse and the chocolate tart were very, very dense so it was nice to cleanse every mouthful with some refreshing sorbet! As usual, both of us had eaten too much so finished off with a fresh mint too! 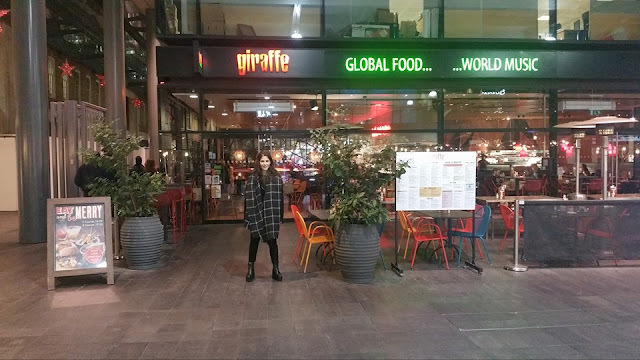 Have You Eaten At Giraffe? I like Giraffe food, its a little different and the gluten free menu is fab.